First up, a column penned by our buddy John Rooney this past week. You may remember John talking about his childhood love for the Philadelphia A’s right here on our site last year. (If you haven’t seen this one yet, you’re in for a treat.) Well here he writes something I was unaware of about the stadium. Shibe Park’s 12-foot rightfield wall not only offered us a fine view of the ballgames, it allowed freeloading fans an opportunity to sneak into the park. Their antics, after getting a boost over the fence, often provided as much entertainment as the game. Landing in the outfield, they snaked their way toward the stands, drawing cheers and jeers from the crowd, as they dodged security guards and the stream from the firehose. Parenthetically, this was the only water spectators would see, as the frugal Connie Mack banned water fountains in order to boost soft-drink sales. A radio broadcast of Richie Allen’s first at bats in Shibe Park as a member of the Cardinals. He had been traded away from the Phillies the previous season in a deal that was similar to the Scott Rolen situation. Insanely talented, feuded with management, and fans took their leaving for St. Louis personally. The crowd only numbered 11,759 that day, but they go nuts each time he steps to the plate, and when he strikes out in his 3rd at bat it sounds like the team just won the pennant. And they go completely bats*** crazy when he hits a homer in his 4th at bat. Also fun to hear By Saam calling the game. I just kind of dig this 14 second clip of Jimmy Piersall hitting a double at Shibe. Gives a cool view of the ballpark. 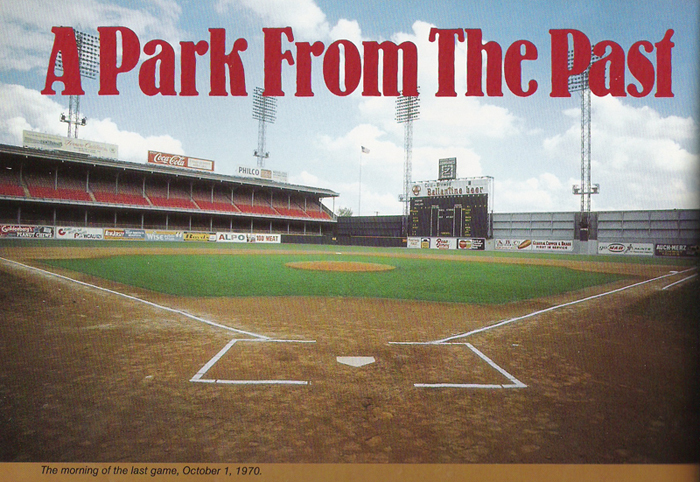 And of course I’m not going to leave you without an awesome Shibe Park photo. I got this off the BEST baseball forum on the interweb. Baseball-fever.com is just mindblowingly awesome. 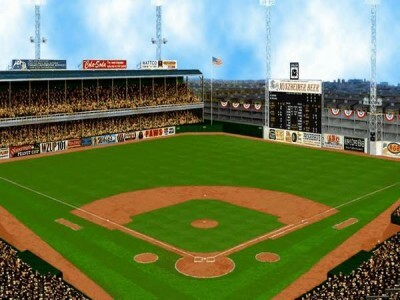 If you are a baseball history junkie like me, I heartily encourage you to join. Here’s a pic of Shibe on the morning of the final game played there. You never know what you might find when you’re trolling the internet after googling “Shibe Park”, but I will tell you this…it usually turns up something interesting. 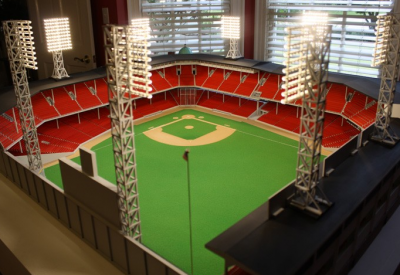 Today was no exception, as I came across Steve Wolf, who makes miniature stadiums for a living, complete with light fixtures. 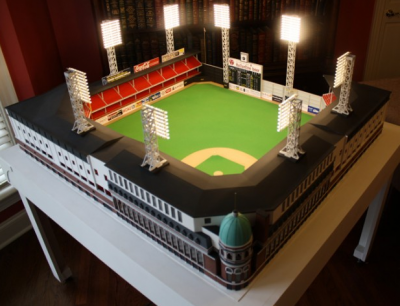 He’s only done a few of them so far, but one of them is Connie Mack Stadium (aka Shibe Park). Here are several photos of his spectacular Shibe recreation. 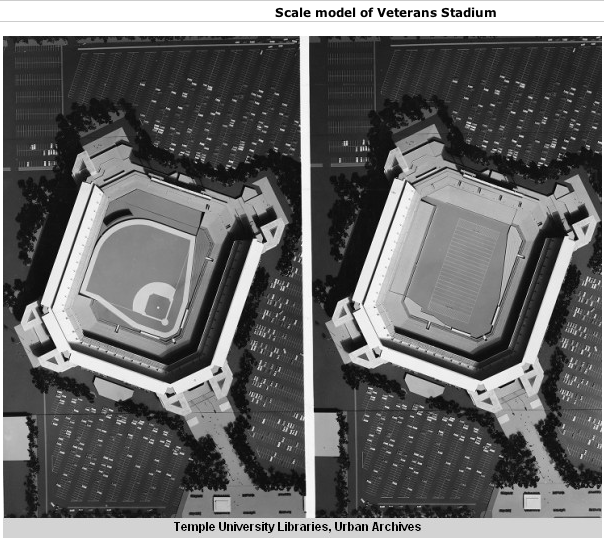 Well worth a look if you’re a baseball stadium geek. 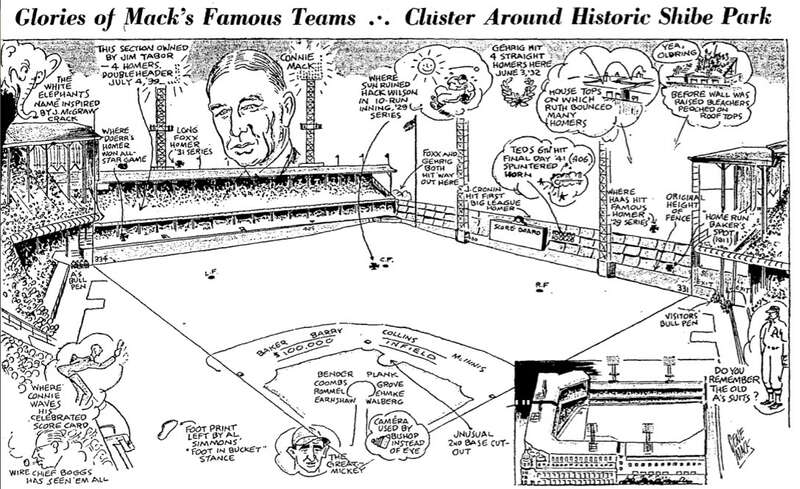 Interview with Shibe Park Historian Bruce Kuklick, Part 2. A few days ago, I posted Part 1 of my interview with local history professor and author Bruce Kuklick, who wrote the incredible book To Every Thing a Season about Shibe Park and how it affected the surrounding neighborhood through the decades. If you are a fan of Philadelphia sports history, this book is simply a must read. In Part 2 of our interview, he talks about the reputation of Connie Mack (left) in the city, whether or not there was an uproar in Philly when the Athletics moved away, and what were the best and worst things about Shibe Park. Next week, he’ll talk about how hard it was to sell booze at Shibe, how rowdy the fans were, and compare it to Citizen’s Bank Park. 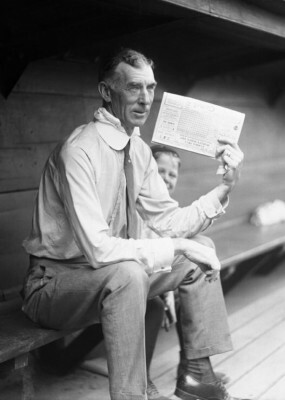 JGT: The book deals a lot with Connie Mack. Obviously, since he ran the team for 50 years. Was he seen as a local hero or as a local goat, or a little bit of both depending? 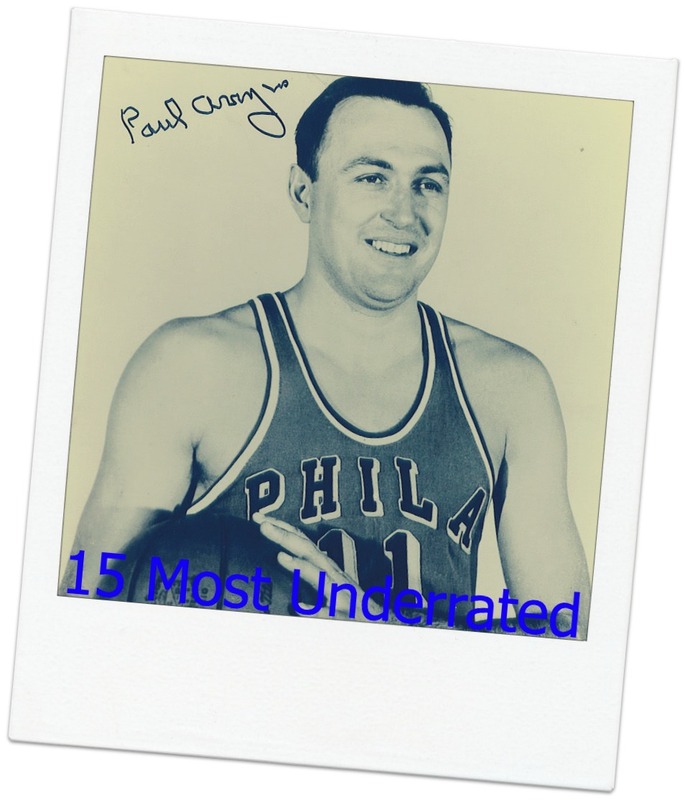 KUKLICK: I’d say in the 1920s, when he’s in his 60s, he looks like he’s over the hill, and then he has this one last hurrah where he creates this 1929-1931 dynasty and he is a Philadelphia hero. In fact he gets, in ’29, the Bok Award, which is usually given to like the governor or some political or social big wig. And that it went to a baseball guy is really extraordinary at that time. In the ’20s, as he built that team up, he is more than a local hero. He is a national sports statesman. Then, when the team tanks in the ’30s and Mack is in his 70s, he goes downhill pretty fast. JGT: King of the city? JGT: When the Phillies won a couple of years ago, the city went nuts, with a party on Broad Street and a parade afterwards. Did they used to do that back then when the A’s won? KUKLICK: Yeah. 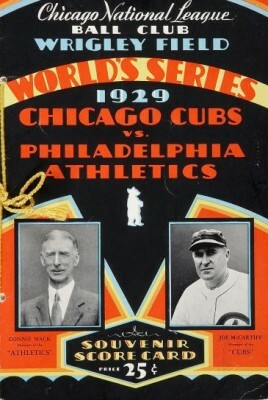 In ’29 is the first World Series win, that’s the big one. Then they do it again in ’30. And after that Mack says, “The Philadelphia fans don’t appreciate a winner. They don’t care about it anymore.” And his argument that he sold off the team was that in ’31 there wasn’t much fan support. And what he wanted to do was not to ensure that they would win, but get them to play .600 ball instead of .680 ball. JGT: So there would be a pennant chase in September and people would want to come out to the ballpark. KUKLICK: Right. But he miscalculated how hard it is to do these things. JGT: It’s hard enough to build a winner, much less a team that wins exactly 60% of their ballgames. KUKLICK: I know that there was a lot of cheering in the streets. Not necessarily down Broad Street. But all over North Philly, you would know that this had happened, that this was big news. JGT: Now, I don’t know if you know this, but the Oakland A’s are probably going to move in the next couple of years. KUKLICK: I did not know that. JGT: They’ll probably stay on the West Coast, but there is a small but vocal local minority that wants them to come back to Philadelphia. Could this area support two baseball teams? KUKLICK: That would be my dream come true. I don’t know. I don’t know. JGT: Well, let’s rewind a little bit. When they did move to Kansas City initially, was there any local outrage? KUKLICK: No. The leaving of the Dodgers and the Giants, is really…I mean, I know people who still won’t forgive the owners who left, Stoneham and O’Malley. Who hate them. Who still hate them. You won’t find that in Philly. The A’s from 1950-54 were really bad, and the Phillies looked so good all of a sudden, people got suckered into thinking they had something with the Phillies. There was a group, Save the A’s, that put together a feeble little attempt of guys with very little money to try to keep the franchise in the city. But they got forgotten (snaps fingers) like that once they left. JGT: Getting back to Shibe. What were the best things about Shibe Park and what were the worst things? KUKLICK: I used to go there as a kid. That’s how I learned my baseball. My dad used to take me. By the end, it was really a dump. When the A’s left the city, Bob Carpenter, who was the Phillies owner, had no alternative but to buy the park. He didn’t want it, he wasn’t interested in ballparks. And he really let it get run down. Because from the very start he was trying to figure out some way to have a new facility. He thought this was a white elephant. For the last 10 years, from about 1960 to 1970, the place doesn’t get maintained at all. That’s the worst part. Also the neighborhood was really decaying. There was no place to park. It really wasn’t a pleasant experience. To read part 3 of our interview with Bruce, click here.